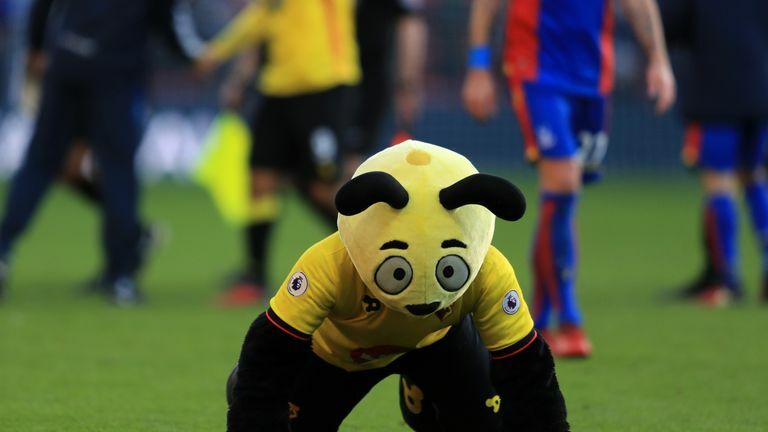 The man behind Watford's Harry the Hornet mascot, who was criticised by Crystal Palace boss Roy Hodgson, has resigned. Last month, Hodgson called the mascot "disgraceful" after he mocked Wilfried Zaha by diving in front of him at the end of a Premier League fixture on Boxing Day in 2016. The forward was earlier booked for simulation in the penalty box. Gareth Evans, who has been performing as Harry the Hornet for a decade, tweeted to say he was "proud" of his achievements and memories at the club. He said on Twitter: "I have officially stepped away from being the match day mascot at #watfordfc my decision, proud of what I have achieved, the memories made and the experiences I've had - I was privileged and now heavy hearted also. Love you Harry!" The then Palace manager Sam Allardyce said the mascot's actions were "out of order", but neither the club or the Football Association took any action. Zaha appeared to take the cheeky act in light-hearted fashion as he sent a post on Twitter to Evans with a thumbs up and a picture of judges holding up scorecards.